Our mission is to provide confidential counseling, therapy, and mediation services to couples, adults, businesses, and in groups in a compassionate and caring environment. Our therapist is very client focused and committed to a high level of client care. Our therapist strives to find the most appropriate and creative solutions to your problems. The former clients of our therapist have always been highly satisfied with both the quality of therapy received as well as the compassionate caring environment in which therapy was provided. For All Your Counselling and Mediation Needs! 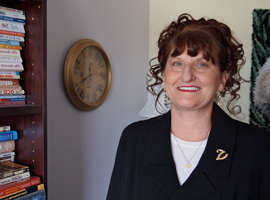 Violet C. Pergel is a Registered Clinical Social Worker and Chartered Mediator. She graduated from Wilfrid Laurier University in Waterloo, Ontario in 1993. She has worked as a therapist for over 19 years, with time spent in Community Mental Health Clinics in Alberta. She opened her private practice in 2005; and currently sees adults, couples, groups, and businesses. Her private practice offers a variety of services including: Counselling/Therapy, Psychotherapy, Mediation, Divorce Coach, Parenting Skills Training, and Personal Skill Development. She also is available for workshops and training. This is a private practice, therefore there is a fee associated with the services provided. Costs for services are not covered under your Alberta Health Card, but costs may qualify under your Employee Health Benefits Program. Preserving your confidentiality is of up most importance at Violet C. Pergel MSW.